How is that possible? Please answer with your email address.....2 Fastest fingers win 1k airtime each!!! From top left: Ugba with yellow peppers and a pinch of ogiri, dried shrimps. chopped onions, garden eggs and utasi leaves. There are many ways of making this dish, I have deleted every other (UNN days) method from my brain, and taken up this one. I like to think it’s a healthier version. hehehe! usually, this dish is made with loads of palm oil, potash and fried fish. Here, I used little oil, more pepper, fermented locus bean seeds(ogiri) and shrimps to elevate the taste. Abacha, soaked in cold water. 2 tbsp of palm oil. Add A BIT more if you are using more abacha. A small handful of utasi (optional) Its a bitter leaf. 4 small local garden eggs. ½ cup dried shrimps (optional). Break away the heads for pounding, while you keep the body whole. This is just 2 tbsp of oil, too much palm oil isn't too good for the body guys. Soak the abacha in cold water for about 15mins. Wash and rinse. Be sure to clean well. Pound (don't blend) the shrimps heads, pepper and ogiri. Rinse out the ugba in tap water. Its usually salty, I feel better rinsing it out. 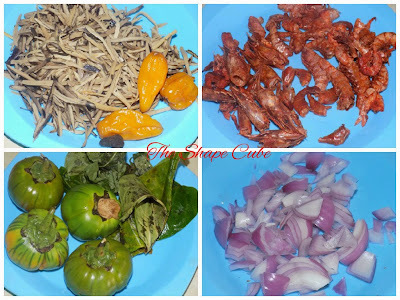 Now, heat a pot with the palm oil, add the pepper and craw fish and stir quickly. Add the ugba and abacha and stir well. Add the shrimp body, Season and take off the heat immediately. If you like the garden eggs and utasi, then chop them up and mix in. Serve immediately. Garnish with the chopped onions. I love to have this occasionally. Its very high in starch content and one can lose control and over eat. Very delicious meal in deed!!! Serve with ponmo or fish. Do you love abacha too? Dont forget to attempt today's giveaway question. I love you, God bless. Nelo ur right! 1k for you!!! I love mine with plenty pepper too. Choi Amanda u got it again o, but pls let me give another person plssssss. MUAH!! You are right Jummy. 1k for you! You are right SweetP. Thanks for trying. Nice DA. Thanks for trying dear. Hmmm...I guess the doctor was his mother.melpink33@hotmail.com. Correct Melpin. Thanks for trying. Hmmmm I only tasted this meal once when I was in boarding house. Haha! You are correct Monica but u werent fast jor. Thanks for trying tho. Oh gosh! how could I have forgoten that Turquoise was your wedding color. Tssshhhh! On today's question, I have to go the christian way, maybe that will touch your heart , I need that recharge card money biko! Yes now Lemi, how could you have forgotten? Hahahaha! You have 1 more try tmrw k. Luv ya!